When we talk about the concept of sacred spaces, we often think about the obvious – synagogues and holy sites. At Ramah Galim, the concept of a sacred space has taken on a whole new meaning for me. Some background: I am the director of a program called Tichon Ramah Yerushalayim (TRY) and am blessed every summer to spend a couple of weeks touring the Ramah camps, talking with high school students about the various options that exist for our chanichim (campers) to come to Israel with Ramah Israel. On both TRY (a 4-month study abroad program for 10-12 graders) and Ramah Seminar (our 6-week Israel trip for rising 12th graders from all of the Ramah camps), we learn about our collective memory and heritage at the precise locations where our history happened, transforming each site we visit into our very own sacred place. From the caves of Bar Kochba to the ancient ruins of Massada, the Old City of Jerusalem to the beautiful Arbel mountain overlooking the Kinneret – we use the landscape and sites of Israel to tell our story, the Jewish story. We transform every site into a holy place of learning, love, and reflection. And yet, with all of this experience under my belt, I was still not fully prepared for the incredible energy, beauty, and spirituality that I witnessed over the past two days at Ramah Galim. 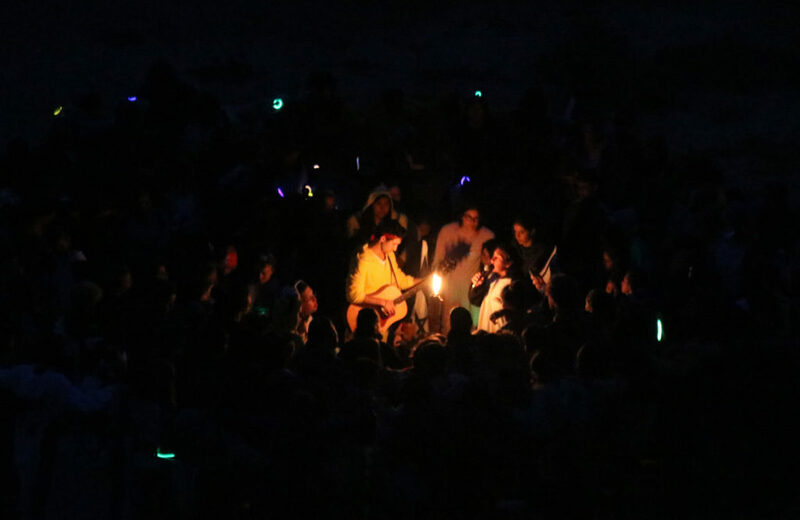 I was privileged to observe chanichim (campers) and tzevet (staff) turning the picturesque boarding school on the Bay into the holiest of sites. I co-taught a class with Rosh Jacob for several Bogrim campers in the “bayit,” making the hallways of a high school dormitory a beit midrash, a house of learning. Rosh Ocean Marci was able to drag me out of bed at 6:15 am to join the Nitzanim and Kochavim campers for “Tefilot Afloat,” transforming the beautiful (and cold) Pacific Ocean into a beit tefillah, a house of worship. The medurah (fire pit) outside of the Hadar Ochel (Cafeteria) became a place of reflection for the afternoon prayer service. “Love the Lord your God with all of your heart” – 5th, 6th and 7th graders sitting on their boogie boards on the sand, expressing thankfulness to God for their families and friends, the incredible view of the ocean, the existence of marine life, and most importantly, the San Jose Sharks. “With all of your souls” – 8th and 9th graders engaging in thoughtful, passionate, and respectful debate regarding their thoughts on a Jewish State and its role in their lives. Campers and staff lending a helping hand to one another, encouraging each other to succeed in their Maslulim (tracks), and being great hosts to all of the visitors (including myself) by practicing the mitzvah of Hachnasat Orchim, welcoming guests. “With all of your might” – Combining Jewish values with incredible activities, as chanichim hone their surfing, acting, horseback riding, kayaking and scuba diving skills (and much more), as part of a thoughtful, values-based educational framework. In short, Ramah Galim has created for itself a sacred space in the unlikeliest of places, and I am honored to have spent time there. I think we can all learn a lot from what Rabbi Sarah, Alana, Nate, and the rest of the staff are accomplishing there. And with that, I’d like to wish all of you a Shabbat Shalom, a peaceful and restful Shabbat!